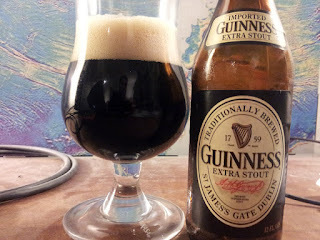 I'm really enjoying this right now, but I think I should've tasted this (a) when not already buzzed, and (b) with the Draught (the one we all get at any Irish bar) for comparison. This is a relatively low body stout (think the opposite of an American Imperial Stout). Even so, there's still enough complexity to be enjoyable. The website makes some comparison to a porter, but I think they've done well to distinguish this. And did you know Student's T-test was developed with the Guinness Brewery? I know it's some boring, nerdy statistics; but it's cool that something scientific can come from beer, independently of our military industrial complex. OK, now I know I'm really buzzed, and it's time to sign off.